Powers/Abilities: Chief among his powers was the ability to heal others. He could also evaluate the spirit of others and see their true nature. He could summon an army of warriors--whom he believed to be angels, but were really demons not actually under his control. (Defenders I#97 (fb)) - David Kessler was a dreamer, an idealist who thought he could change the world just by preaching a message of peace. When others gave up on the message, David put his energies to better use--working at a school for handicapped children, and other, similar efforts. No matter how hard he tried, it never seemed to make a difference. Eventually he quit his job and went to Israel, to seek out his roots. After 20 days alone in the desert, an angel appeared to him, telling David that he was the one, true messiah foretold in the Hebrew scriptures. It filled him with divine power and sent him to begin his mission of raising the world up from its current state. Unbeknownst to David, however, the angel was actually the demon Hyppokri (or one of his agents), one of the demonic cabal known as the Six-Fingered Hand, and the power that filled him was anything, but divine. (Defenders I#97 (fb) - BTS) - David traveled across Israel, performing miracles of healing and slowly recruiting a following. At a kibbutz in Israel, Cory Payne met David, and was taken with his mission. She wrote to her husband, Eric Simon Payne, telling him of the bliss she had found. 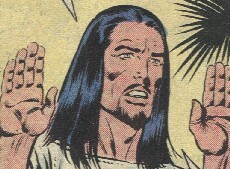 (Defenders I#97) - Eric Simon Payne, the Devil-Slayer, suspected that Kessler might be an agent of the Six-Fingered Hand, and he contacted the Defenders for assistance. Working with them, he teleported to Israel, where they witnessed David--in mid-"miracle"--restoring the site of a blind man. 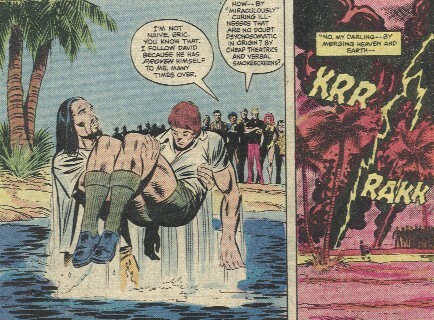 Wishing to test the validity of David's claims to a healing power, the Defenders--mystically disguised as normal civilians--brought forth Kyle Richmond (Nighthawk), who at the time was cursed to daytime paralysis. Eric teased his wife's belief in Kessler, but he had no explanation when Kessler finished his work and Kyle walked back to them. Daimon Hellstrom was less taken aback, and denounced Kessler as a demon. Kessler tried to touch the soul of Daimon (and Isaac Christians, at his side), but as he did, the pair stood revealed as the Son of Satan and the Gargoyle. Believing them to be agents of the devil, David summoned an "Army of Archangels" to vent God's wrath on them. 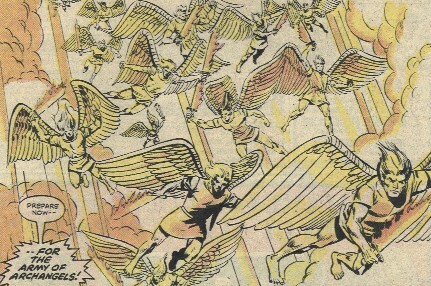 The remaining Defenders revealed themselves and fought back against the "angels." After a short and brutal struggle, Kessler returned to his senses and decided that violence was not the correct path, even against agents of evil. He attempted to disperse the angels, but found that they no longer responded to his wishes. Strange then unveiled the "angels" as demons, and Kessler dropped to the ground, in disgust, frustration, and anger of his role in these events. These darker emotions allowed Hyppokri to then take control of David, who then blasted Devil-Slayer into submission. As he raised his hands to finish off Devil-Slayer, Kessler managed to reassert his will again briefly, and he leapt atop Devil-Slayer's sword, ending his life and exorcising Hyppokri. The "Army of Archangels" vanished along with Hyppokri. Comments: Created by Jean-Marc DeMatteis, Don Perlin, and Joe Sinnott. Kessler's past was first stated as having been in the 1960s, but this is topical. More likely, his past started 15-20 years before the main story, which was set in the modern era. David Kessler is pictured in the Six-Fingered Hand an entry in Mystic Arcana: The Book of Marvel Magic. The story is better explained in this interview (question #5). Hyppokri was one of the minor demons gathered into the Six-Fingered Hand by a coalition of major demons as part of a plot to weaken the dimensional barriers and bring about literal Hell on Earth. Given only a portion of the major demons' plans, the Hand believed their actions would enable them to rule a portion of the Earth. Hyppokri, in particular, sought to take a pure spirit and use its very nobility as their weapon. He figured that Kessler's innate goodness would have drawn hundreds of thousands to him, and--secure in the belief that he was leading humanity towards a new, golden age, he would have drawn them straight into the Hand's clutches. The Defenders, however, unmasked Hyppokri's plot, and Kessler committed suicide to prevent himself from having any part of it. Banished from his human host, Hyppokri returned to Hell, where they prepared a trap for the Defenders, who soon were soon pulled into Hell. 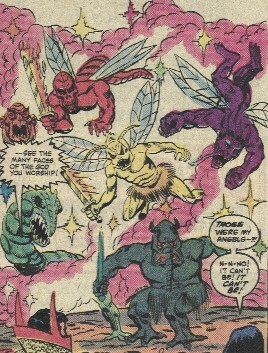 Hyppokri and his allies, more powerful in their home dimension, fought the heroes in an even battle--until Mephisto siphoned the accrued power of the Six-Fingered Hand into himself and his three allies: Satan, Satannish, and Thog. A legion of minor demons serving Hyppokri, they were summoned by Kessler to fight off the Defenders, whom he believed to be agents of the devil. They took angelic form, had wings, and brandished swords, but the illusion began to fall apart when Kessler came to his senses and tried to banish them, only to find that they no longer obeyed him. Dr. Strange exposed them for what they really were, and they were similarly banished from Earth when Hyppokri was forced to abandon Kessler's form upon his death.